The Sabres didn’t fetch a king’s ransom for Dominik Hasek but it feels as if Hasek has claim to the highest profile trade in franchise history. 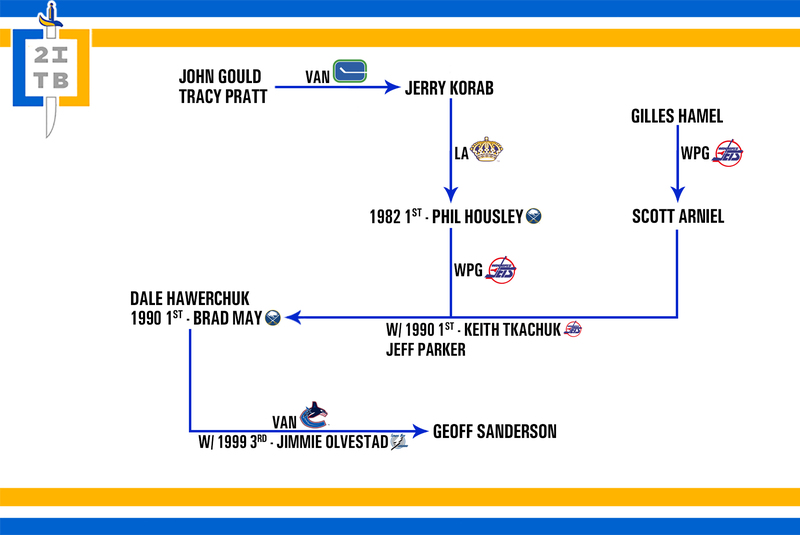 Maybe the LaFontaine/Turgeon or Andreychuk/Fuhr swaps earn the title given their blockbuster status, but it’s not every day a team trades away of the greatest to ever pull on the crest. The Hasek trade was pretty underwhelming, more so given Slava Kozlov’s disdain for the area and limited production on the ice. Of course, the Sabres paid pennies on the dollar for the greatest player to ever play his position. So even though the return from dealing Hasek pales in comparison to other marquee deals, Hasek’s on-ice contributions more than make up for it. Perhaps the biggest obstacle the Sabres have faced as they slog through their rebuild has been the inability to turn the mountain of assets they originally acquired into tangible NHL talent. Some of that has been inflicted on the trade market – packaging assets for NHL talent – while some has come at the draft table. The picks and players that can be traced back to the original trade that sent Thomas Vanek to the New York Islanders have offered the Sabres very little in the end. This was one of the first trade trees I had ever explored, intrigued by the stacked deck Tim Murray and Darcy Regier had combined to create. 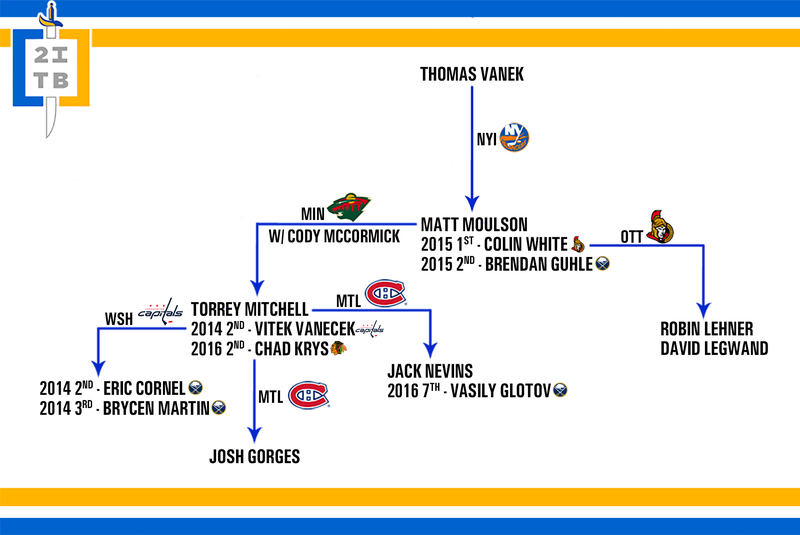 At one point the Sabres had turned Vanek and a pair of second round draft picks into Matt Moulson, Torrey Mitchell, Josh Gorges and four draft picks (a second and third in 2014 and a first and second in 2015). 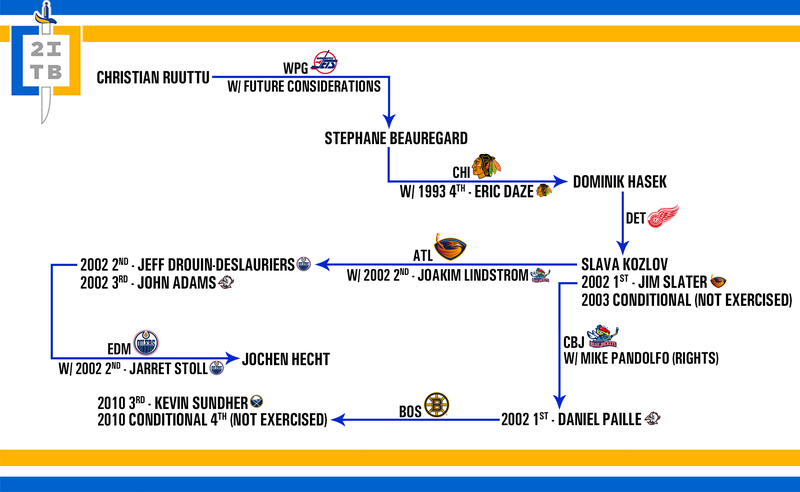 Now that the trade tree has aged (poorly) the Sabres are looking at a fairly lackluster return for what they’ve sent away. Torrey Mitchell was a terrific fourth line asset but not exactly a long-term option for the Sabres. He only yielded a seventh round pick and although Vasily Glotov is an extremely fun prospect to have in the pipeline, the chances that the Sabres see much of anything come of that trade are minimal. The same can be said of nearly every other portion of the tree. 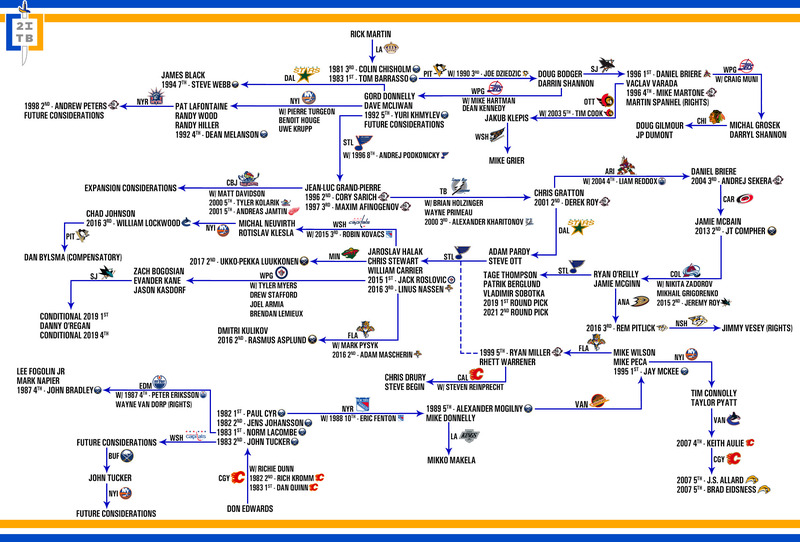 Moulson and Gorges hit the wall hard and Robin Lehner’s days in Buffalo seem to be numbered. 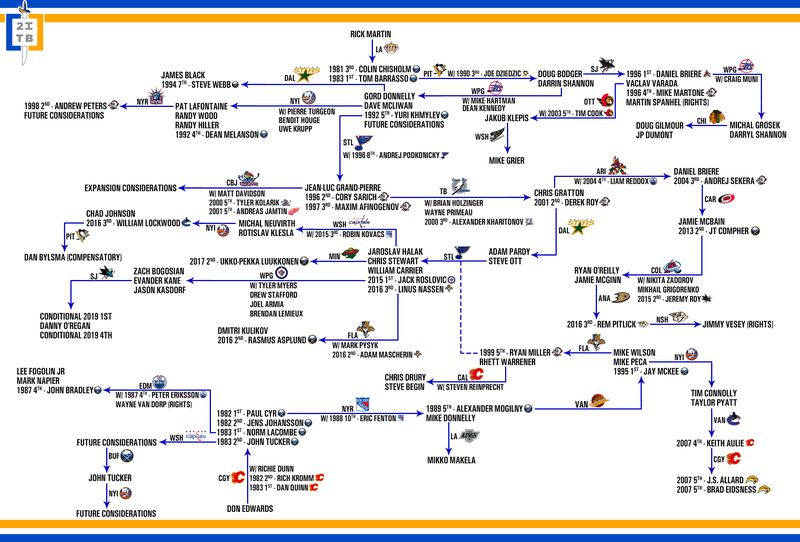 The only player in this entire trade tree who has the opportunity to offer the Sabres any long-term return is Brendan Guhle. 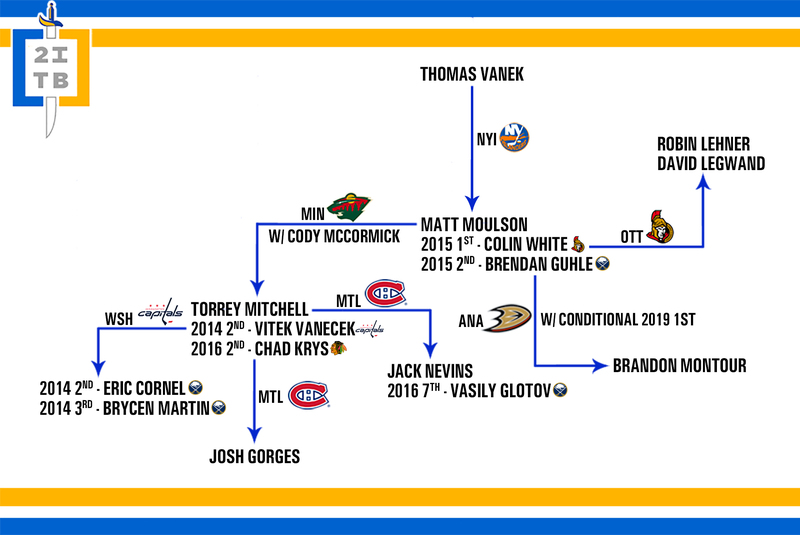 The Vanek trade tree went south in a hurry, with the prospects attached to the numerous picks failing to develop in a meaningful way while the Sabres opted to flip the premium pick they received for a goaltender whose future in Buffalo appears to be questionable. *One quick note on the format of the trade tree. I’ve added logos next to the players selected with the respective picks used in the deals displayed. This was meant to add some clarity to the layout as not every pick was used by the team which acquired it. For example, the Canadiens sent the pick they acquired for Gorges to the Chicago Blackhawks, who picked Chad Krys with the selection. This came in handy on some of the larger trees which I’ve worked on as it illustrates the end point for some of the draft picks which, at times, traded hands multiple times.